Over the summer I consume cold soups like gazpacho by the bowl, but with the onset of fall, I immediately gravitate towards cozy hot soups, stews, braises, and anything roasted. In New England, the weather can be a tease. Sometimes you step outside and you’re greeted with a light breeze and the caress of the warm sun. A brilliant plumage of fall leaves greets you as you walk by. Other days, you’re met with a constant drizzle, fog, and a chill that reaches through your layers. Either way, I trek to the local farmstand and fill my arms up with fall produce. 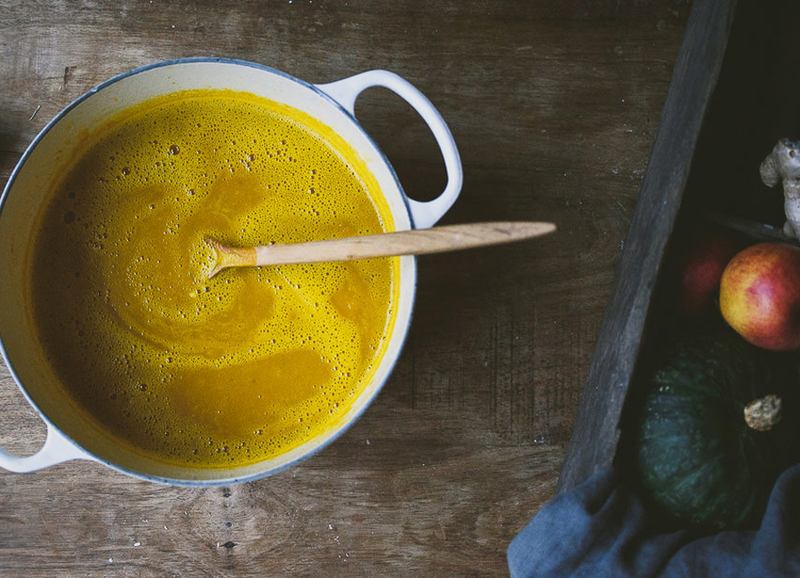 This soup combines two of my favorite seasonal treats: kabocha and apple. 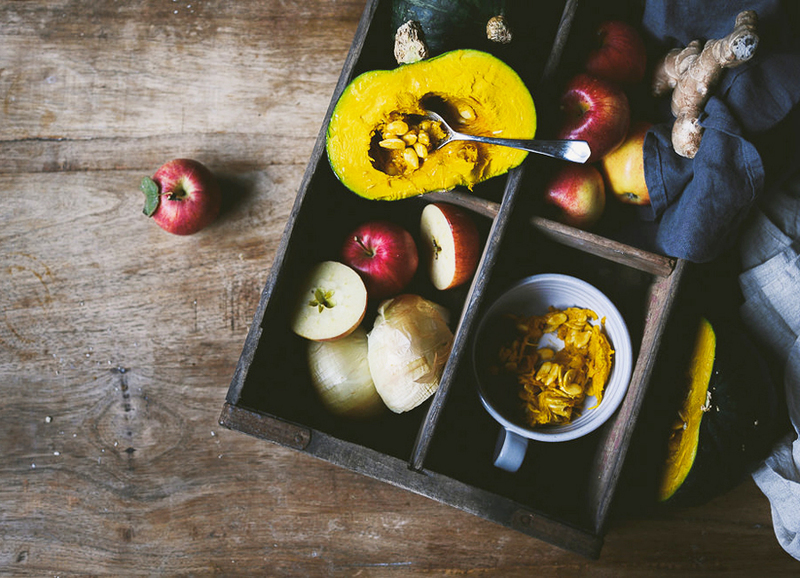 Kabocha is a Japanese winter squash that some people call “Japanese pumpkin”. It has a relatively thick green skin and an almost yellow ochre and orange flesh. The green skin is edible, but for this soup I peeled the skin off. Kabocha and apple are cooked and then blended together with an immersion blender. As a result we have a thick but smooth soup, the epitome of comfort, topped with crème fraîche, toasted pepitas, and slices of apple. In a large saucepan, heat butter over medium heat. Add onions and garlic and cook until softened and lightly brown, about 5 minutes. Add kabocha and apples and stir to combine. Add ginger slices and minced ginger. Add chicken stock and bring to a boil. Add bay leaves and cinnamon stick. Reduce heat to low, cover, and simmer for 15-20 minutes, until kabocha is fork tender. Remove from heat. Remove and discard ginger slices, bay leaf, and cinnamon stick. Using an immersion blender, purée mixture until smooth. Place saucepan back over low heat and stir in milk, taking care not to boil it. Season with salt and black pepper. Spoon into bowls and serve with desired toppings. For more great seasonal recipes, check out our fall ’15 issue.